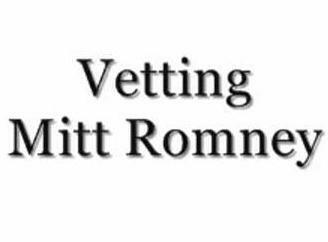 This entry was posted on Sunday, March 25th, 2012 at 17:45 and is filed under Election 2012, Featured, Mitt Romney, News, Politics, Video. This one just came over the transom and I thought readers might want to take a look. It’s a pretty sharp critique of Mitt Romney’s record, and I think the more conservatives know about his record, the less attractive he is as a candidate. The video touches on a number of stories I’ve covered here over time, so much of this will be at least vaguely familiar. There has been a great deal of vetting of Mitt Romney’s record on the Internet, in blogs and on conservative websites, but the problem is that most of it never gets into the mass media. They’re simply not interested in showing Republicans much of his record as it pertains to governance, including particularly the Romney-care debacle under which the people of Massachusetts now live. The MSM is “not interested in showing Republicans much of his record as it pertains to governance” RIGHT NOW, but just wait until Romney is up against Obama. ALL of this and more will come out in spades. They are just waiting until the actual “coronation” to use class warfare and hiding money overseas and… and…. I’m with you – we need to carry on with this process and not just assume “the inevitable”. I am planning to vote for Newt in Texas and, patiently hope and pray that he will stay on message about the economy and Mitt and/or Rick will implode on their own. Rush has said several times that the brokered convention may not be near as bad as some of the “sky is falling pundits” like Morris & Rove say it is. There just may be some value in delaying the eventual barrage of liberal, Demoncratic lies and distortions about the R nominee as long as possible, no matter who it is. Great post. Thank you for putting this video out hope many, many people watch this. Perhaps you should send a copy to the GOP establishment in DC, a copy to Rove and the RNC who are pushing Romney down our throats. because he does the same things he publicly condemns others for doing. involved in the bedroom, we shouldn’t get involved in cultural issues.